The Annual deadline for all entries is March 1, 2019. Colorado FCCLA is pleased to offer two scholarships to members. The scholarships are awarded at the Annual State Leadership Conference. Each Scholarship is for $1,000. The intent of the Promise Award Scholarship is to honor one Colorado FCCLA member from grade 12 who has shown promising potential in supporting the mission of FCCLA. The recipient of this award should be a member who has led their chapter, community, district, and state with their commitment and inspiration over the past year or years. This is a self-nominated award/scholarship and is not open to current state officers. 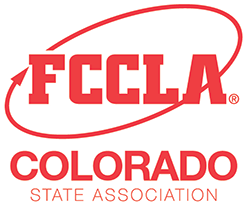 The Leadership Scholarship will be awarded to one outstanding senior who has been an officer at any level of the Colorado FCCLA organization. Criteria for this scholarship include leadership shown by the officer and how their leadership opportunities will impact their future. Escoffier offers scholarships to winners in Baking & Pastry, Cake Design, Culinary Arts, Front of the House, Gourmet Food Production Savory, Gourmet Food Production Sweet, Knife Skills, and Thematic Table Design at the following levels: 1st place winner-$5,000, 2nd place winner-$3,500, and 3rd place winner-$2,000. All FCCLA members will receive a $1,000 scholarship. The Culinary Institute of America (CIA) will offer scholarships to winners in Baking & Pastry and Culinary Arts at the following levels: 1st place winner-$2,000, 2nd place winner-$1,500, and 3rd place winner-$1,000. FIDM offers FCCLA members a scholarship for $1,000.00 and an FCCLA State Officers’ scholarship for $1,500.00. FIDM will also offer $3,000 to the first place winner in both the Occupational and Senior level in Fashion Design, Interior Design, and Recycle and Redesign STAR Events. JWU will offer scholarships to winners in the Culinary Arts; Entrepreneurship; Entrepreneurship; Fashion Design; Hospitality, Tourism, and Recreation; and Sports Nutrition STAR Events at the following levels: 1st place winner-$1,000, 2nd place winner-$750, and 3rd place winner-$500 (all are four-year renewable).